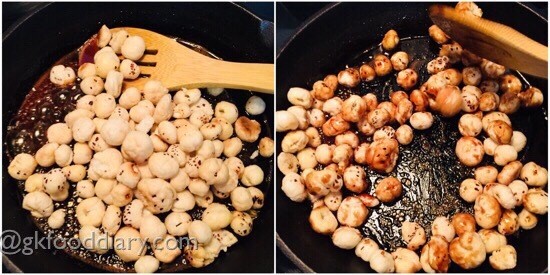 Sweet Makhana -roasted puffed lotus seeds/fox nuts sweetened with jaggery which makes a healthy snack for kids. 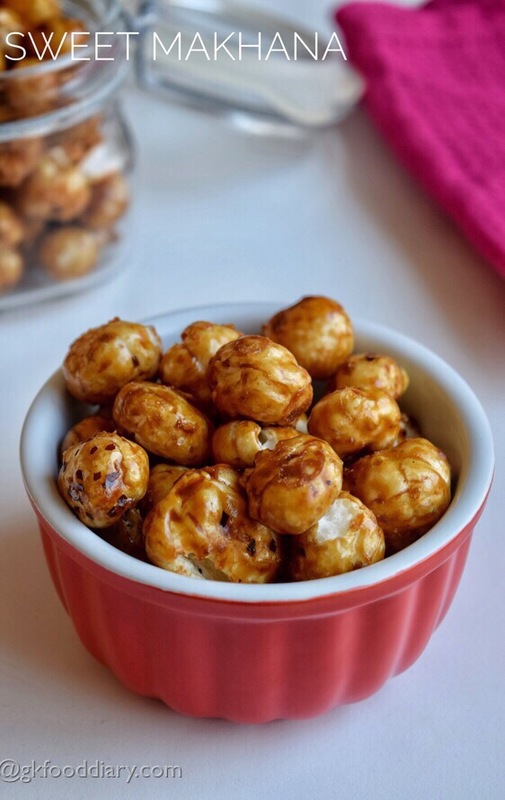 I have already shared a spicy version of roasted phool makhana, this is a sweet version of it. It tasted good and got over in no time. You can easily double the recipe and store it in an airtight container if you want to make it bulk. 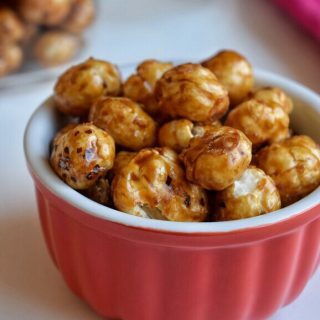 This sweet makhana is a best evening snacks for kids from one year. Check out more recipes with phool makhana for babies and kids here. 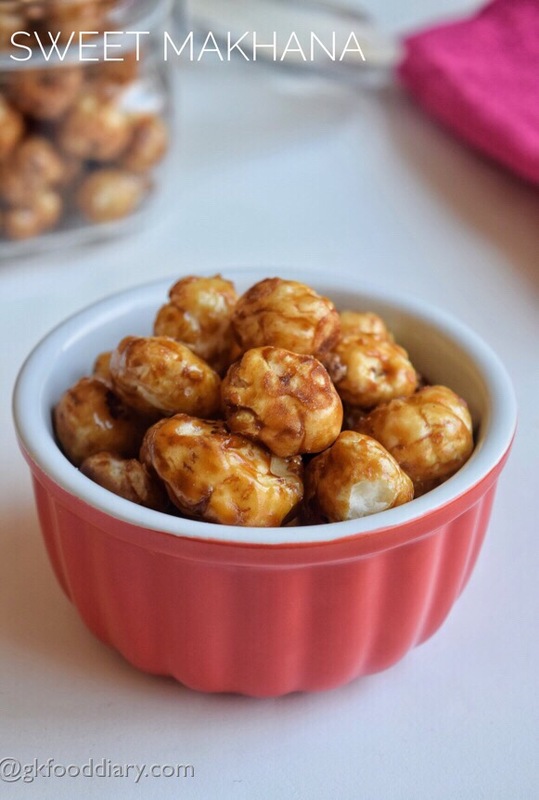 Do try this healthy snack and enjoy with your kids and family. 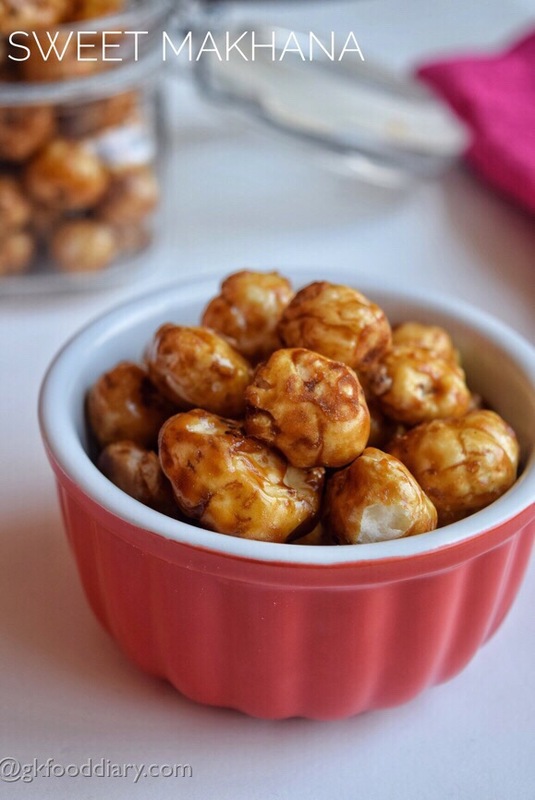 Here is how to make sweet makhana recipe for toddlers and kids. 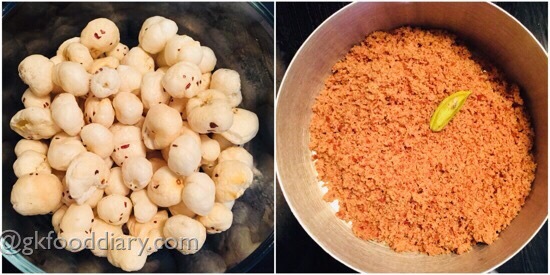 Sweet phool Makhana -sweetned and roasted fox nuts. 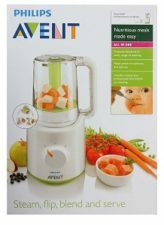 Great healthy snack for kids. Measure phool makhana and jaggery. keep it ready. 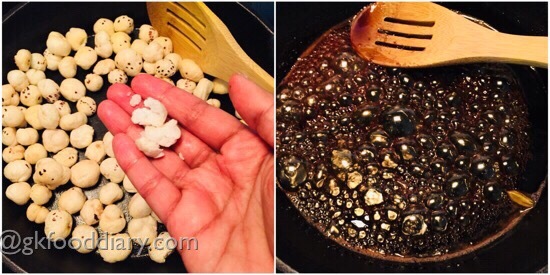 Heat a tsp of ghee in a pan and melt it. Then add the phool makhana to the pan and start roasting in a low flame. Roast the makahana until crispy and you should be able to break easily with your fingers. 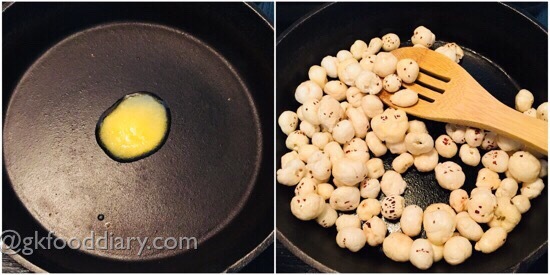 Once the phool makhana is roasted well, remove from the pan. Then add in powdered jaggery, 1 tbsp of water along with cardamom. Heat it in low medium flame until it starts bubble up nicely. Add in roasted phool makhana at this stage and switch off the flame immediately. Then mix it gently. Keep stirring continuously until the jaggery is well coated with makhana. Remove the pan from the stove once done. Cool it down and store them in an airtight container. 1. Measure phool makhana and jaggery. keep it ready. 2. Heat a tsp of ghee in a pan and melt it. Then add the phool makhana to the pan and start roasting in a low flame. 3. Roast the makahana until crispy and you should be able to break easily with your fingers. Once the phool makhana is roasted well, remove from the pan. Then add in powdered jaggery, 1 tbsp of water along with cardamom. Heat it in low medium flame until it starts bubble up nicely. 4. Add in roasted phool makhana at this stage and switch off the flame immediately. Then mix it gently. 5. Keep stirring continuously until the jaggery is well coated with makhana. Remove the pan from the stove once done. Cool it down and store them in an airtight container. The sweet phool makhana is ready! Do everything in low flame to get the perfect texture and taste . 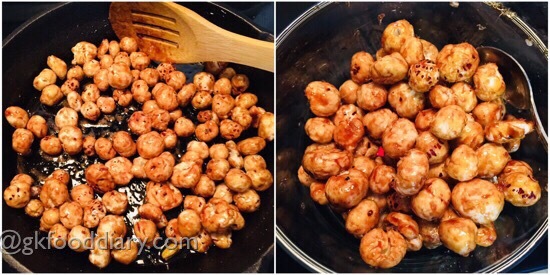 Be sure to roast the makhana well before adding Jaggery. Take one roasted makhana, eat & check its crispy and not chewy. You can use brown sugar instead of jaggery. Add 2 tbsp of shredded coconut for extra taste. It stays well for 1-2 week in an airtight container. If you are making in bulk, do it in batches. Adjust sweetness according to your child’s preference. 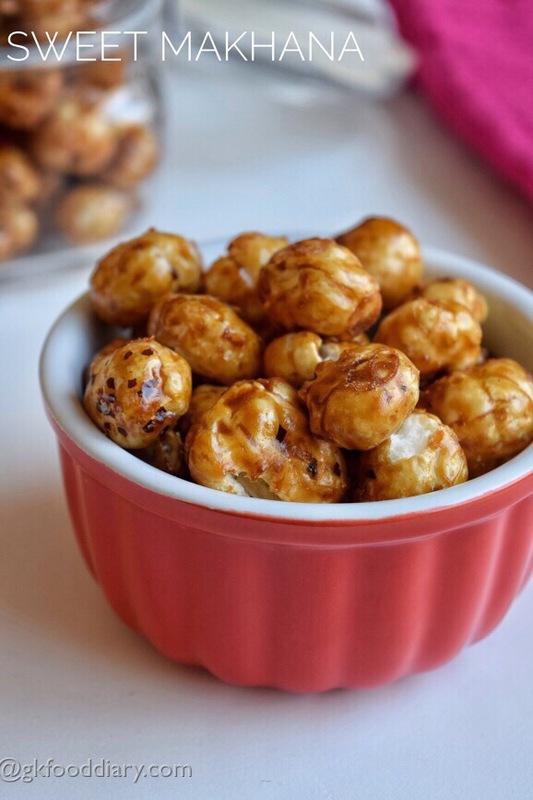 For small babies and Cut the roasted makhana into small pieces in order to avoid choking.